I like working out. I get all squirrely if I don’t. Almost as if excess energy is building up inside of me (uh,which it probably is) and if I don’t get it out of my system I’ll go nuts. Actually I know I do. Go nuts that is. I get really impatient. And angry. And frustrated. Oh and did I mention that squirrely feeling also makes it difficult for me to relax? Enjoy a book or some other quiet time activity? Yes, indeed. 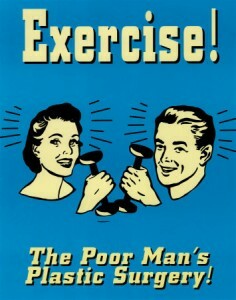 I need to exercise. Which is why I’m a bit flabbergasted that I keep letting things get in my way of getting it done. I don’t like that I’m letting it happen. A few Ottawa peeps have joined the 100 Club. The brain child of Andrea Tomkins, the basic goal is to burn 100 calories every day for 100 days just by doing a few easy exercises. There’s a shared calendar that folks can use to track their progress. In theory I also joined the 100 Club. I say in theory because while I have access to the calendar, I haven’t tracked my activities. It is with great joy I can look on this page, and see my name listed. Yay me!!! Do some form of exercise each day – run up and down the stairs at work (5 flights), go for a walk, do a workout routine, whatever. Drink at least 3 glasses of water a day. While it should be more, 3 is a good start for me. Stretch! Take 10 minutes a day to do it. There’s probably more I should add but for now, I’m happy to work on the above. My goal is to move every day. 1-2-3, go!